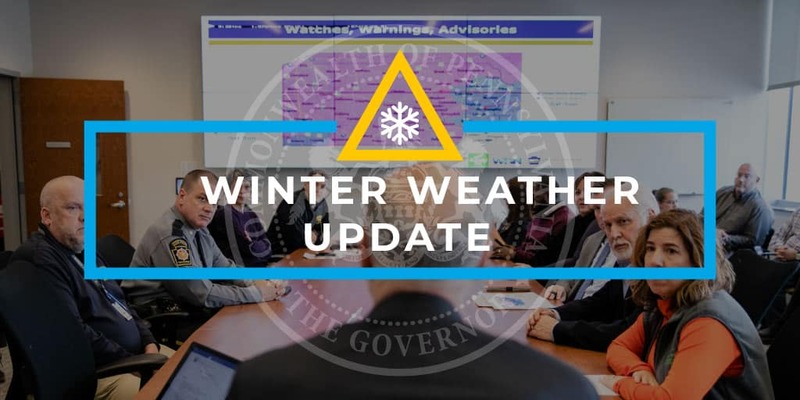 Harrisburg, PA – With a slow-moving winter storm expected to bring snow, sleet, ice accumulation and rain across the state lasting into Wednesday, Governor Tom Wolf today reminded Pennsylvanians that the state of emergency declaration he signed in January remains in effect to allow for increased assistance with storm-related needs. PennDOT and the PA Turnpike are implementing phased restrictions through the storm. Depending on conditions, restrictions may be expanded or reduced. See a map of planned restrictions at www.penndot.gov. When restrictions are in effect, see www.511PA.com.